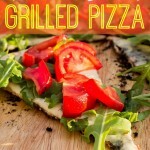 A simple tomato and arugula salad with melted mozzarella cheese on top of a smokey, grilled pizza crust. Rub a little olive oil onto a cutting board to lightly grease the surface. Place the pizza dough on the cutting board and turn over so both sides are lightly oiled. Cover with a kitchen towel and set aside for 30 minutes. Heat one side of a charcoal or gas grill to medium-high heat and the other side to medium-low heat (if using a charcoal grill, bank most of the coals to one side while leaving a few hot coals on the other side). Place the tomatoes in a bowl. Add the lemon juice, salt, basil, and the 1 TB olive oil. Toss to combine and set aside. Using a rolling pin to roll the dough into a circle about 1/16 inch thick. Carry the cutting board and all of the remaining ingredients plus the tomato salad out to the grill and place the dough on the hot side of the grill. Grill until the underside is browned and has grill marks, 1-2 minute. Using a grilling spatula to turn the dough over onto the cooler side of the grill. Place the mozzarella on top of the pizza, cover the grill (if using a charcoal grill make sure the vent holes in the cover are open), and cook until the mozzarella is melted, 2-3 minutes longer. Transfer the pizza to a pizza peel or cutting board and slice. Top with arugula. Use a slotted spoon to transfer the tomato salad to the pizza and serve.